In the previous tutorial, How To Draw Vector Shapes In Photoshop CS6, we learned how to use the five basic shape tools in Photoshop (the Rectangle Tool, the Rounded Rectangle Tool, the Ellipse Tool, the Polygon Tool, and the Line Tool) to add simple geometric shapes like rectangles, squares and circles, as well as stars, starbursts and direction arrows, to our documents. While circles and squares do have their uses, what about more complex and interesting shapes? What if you wanted, say, a heart shape to use as a border for a wedding or engagement photo? Or the shape of a dog or cat to add to a pet store logo? How about shapes of flowers or leaves, snowflakes, music notes, or even a copyright symbol to add to your images? Photoshop actually includes all of these shapes and more, and we can add them to our designs and layouts just as easily as adding circles and squares. Adobe calls these more complex shapes custom shapes, and we draw them using the Custom Shape Tool. The only problem is that, by default, only a handful of these custom shapes are available to us. Most of them are hidden. So in this tutorial, we'll learn everything we need to know about drawing shapes with the Custom Shape Tool, including how to access every custom shape that Photoshop has to offer! If you're not yet familiar with the basics of drawing vector shapes in Photoshop, I highly recommend reading the previous tutorial before you continue. Clicking and holding on the Rectangle Tool, then selecting the Custom Shape Tool from the menu. With the Custom Shape Tool selected, the next thing we want to do is make sure we're drawing vector shapes, not paths or pixel-based shapes. We learned the important difference between vector shapes and pixel shapes in the Drawing Vector vs Pixel Shapes tutorial, but in short, vector shapes are flexible, editable, and resolution-independent, meaning we can edit and scale them as much as we want, and even print them any size we need, and the edges of vector shapes will always remain crisp and sharp. Setting the Too Mode option to Shape. Clicking the thumbnail opens the Custom Shape Picker, with thumbnail previews of each shape that we can choose from. Use the scroll bar along the right to scroll through the thumbnails. The Custom Shape Picker, with thumbnail previews of each shape. In the bottom half of the menu that appears, you'll see a list of all the custom shape sets that Adobe includes with Photoshop. The shapes that are displayed initially are the default set, but looking through the list, we see that we have lots of other interesting sets, like Animals, Music, Nature, and so on. To load one of these sets, simply choose it from the list. Choosing All will save you a lot of guess work. Photoshop will ask if you want to replace the current shapes with the new ones. If you click the Append button, rather than replacing the current shapes with the new shapes, it tells Photoshop to keep the existing shapes and simply add the new ones below them. That may be a good choice if you were selecting an individual shape set from the list and you just wanted to add it to the default shapes. The default shapes are included when choosing All, so just click OK.
Click and drag the bottom right corner to resize the Custom Shape Picker. Double-clicking the heart shape's thumbnail. Clicking the Fill color swatch. The No Color, Solid Color, Gradient, and Pattern fill options. Selecting the No Color option on the left will leave your custom shape blank, which may be what you want if you need your shape to contain only a stroke outline. We'll see how to add a stroke in a moment. The Solid Color fill option. Clicking the Color Picker icon. 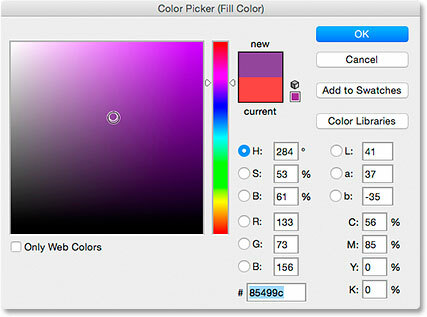 Choosing a fill color from the Color Picker. Choosing a solid red for my fill color. Click to set a starting point, then drag away from the point to draw the shape. Photoshop fills the shape only after you release your mouse button. Going to Edit > Undo Custom Shape Tool. Press and hold Shift as you drag to draw the shape with the correct proportions. When you're happy with the size of the shape, release your mouse button, then release your Shift key. It's very important that you release the Shift key only after you've released your mouse button or it won't work. Also, make sure you wait until after you've started dragging before pressing and holding the Shift key or you may get unexpected results. You'll usually want to draw custom shapes with the correct proportions. Along with pressing and holding Shift while dragging to draw the shape with the correct proportions, you can press and hold your Alt (Win) / Option (Mac) key while dragging to draw the shape out from its center rather than from a corner. Pressing and holding Shift+Alt (Win) / Shift+Option (Mac) while dragging will draw it with the correct proportions and draw it out from the center. Just remember to always release the keys after releasing your mouse button. The current width and height of the shape. Click the link icon before changing the width or height to lock the proportions in place. Click once inside the document to open the Create Custom Shape dialog box. Clicking the Stroke color swatch. The No Color, Solid Color, Gradient, and Pattern options, this time for the stroke. Choosing a solid black as my stroke color. The same shape, now with a black stroke applied. Increasing the width of the stroke with the slider. For Align Edges to work, change the measurement type of your stroke width to pixels. The shape after changing the stroke width to 10 ox. The Layers panel showing the Shape layer. Choosing the butterfly custom shape. Clicking and dragging to draw the butterfly (with Shift held down). The new shape used the exact same fill and stroke as the previous shape. Fortunately, because Shape layers in Photoshop remain fully editable, there's no need for me to undo and redraw the shape if I needed it to be a different color. As long as I have the Shape layer selected in the Layers panel (and the shape tool still selected from the Tools panel), I can easily go back and change the colors. The Layers panel showing both shapes, each on its own Shape layer. Selecting a new fill color for the butterfly shape. Changing the width of the stroke for the butterfly shape. The result after editing the butterfly shape. Selecting the heart shape layer. Changing the width of the stroke for the heart shape. The result after changing the stroke width for the heart shape. Click OK when Photoshop asks if you want to revert back to the defaults. And there we have it! That's how to go beyond circles and squares and add more interesting custom shapes to your layouts using the Custom Shape Tool in Photoshop CS6! Visit our Photoshop Basics section to learn lots more about Photoshop!